Corel just released PaintShop Pro 2018, the latest version of its image editing and graphic design software suite. For this latest version, the Corel engineers have managed to reduce launch times and create a simplified graphical user interface with a new Dual Workspace Environment. There are also customizable tool bars and a number of improved editing tools, including Crop, Text, Selection, Clone Brush, Gradient Fill, Eraser and the Dropper tool. In addition PaintShop Pro 2018 gets you ten new color palettes, thirty new brushes, thirty new gradients, thirty new textures and fifteen new patterns. If you decide to opt for the Ultimate edition you'll also have access to a collection of add-ons including Painter Essentials 5, Perfectly Clear 3 SE and After Shot 3. Corel's new Photo Video Bundle combines PaintShop Pro 2018 and VideoStudio Pro X10 for a complete photo, design, and video editing package. All software options are available in several languages. PaintShop Pro 2018 will set you back $80 while the Ultimate edition is $100. For the Photo Video bundle you'll have to invest $160. 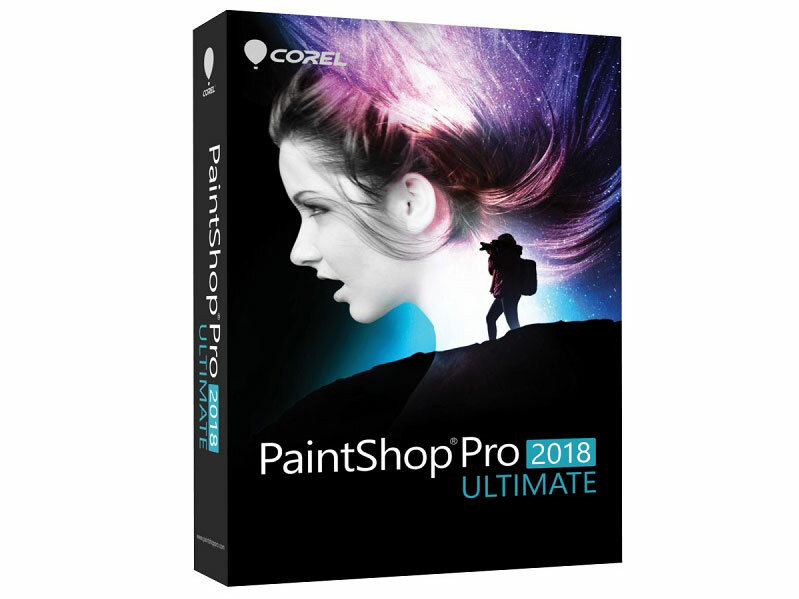 Corel introduces PaintShop® Pro 2018, the complete photo editing and graphic design suite that offers more speed, flexibility, and creativity than ever before. Enhance your editing experience with a redesigned and customizable user interface that's now friendlier with high-resolution displays and pen and touch devices. Start and finish your next project faster thanks to improved performance under the hood -- and express your creativity with more than 125 pieces of exciting new content including brushes, gradients, textures, and patterns. "Whether you're looking for professional photo editing power or just getting started, you need software that lets you jump in and be productive right away. PaintShop Pro now lets you choose from two unique interfaces, plus it gives you the ability to customize them to build an editing and design environment that's uniquely your own," said Chris Pierce, Product Manager for Corel Photo. "With PaintShop Pro 2018, we're delivering a dramatically faster, easier, and highly creative experience that's even more accessible and of course, still subscription free." NEW! Dual Workspace Environment: Introducing two new workspaces designed to match the way you work! New to photo editing or looking to focus on a core set of tools? Try the new Essentials workspace for an easy-to-use, streamlined look. Or, if you're a PaintShop Pro expert, switch to the Complete workspace for a more traditional experience that offers access to the software's complete editing and design capabilities. ENHANCED! Faster Launch Time & Performance: Time is precious and whether you're launching a program or performing a specific action, no one likes to wait around. PaintShop Pro 2018 launches more than 50% faster than the previous version (X9), while the software's most popular tools now respond with near-instant results. Text Wrapping is faster and Depth of Field adjustments can be achieved 4 times quicker than before. NEW! Perfectly Clear 3 SE: Restore details, color, and other elements lost by your camera with the proven, patented corrections. Create a custom look with robust, time-saving presets that let you control multiple adjustments with just one click -- all without leaving PaintShop Pro. AfterShot™ 3: With the addition of AfterShot, get a one-two punch to rival Adobe's Creative Cloud photography subscription, only without the monthly fee -- including, digital asset management, RAW conversion, and adjustment. Take advantage of non-destructive editing that preserves your original, whether you edit one version of your photo or 100. In this version (2018), thumbs are deleted every time the program start and it's take a very "long" time to recreate it's. It's the way Corel take to give performance. i am not sure. but i think the clone function is not so good like in photopaint. mayby dont found the settings, but in x9 is a desaster for me. not so fine and accurate. I downloaded the upgrade and I can't get it to run. It says it's downloaded 100% and you may need to restart, I've done all that and no change from original PSpro9x. Any ideas, it's the weekend and no tech help available. Even though I use Photoshop CC, I still keep around a copy of PSP 4.12 (1997) because of the easier method of cloning. In PSP, you simply right-click-release to set the source point. In Photoshop you have to hold down the mouse and ALT at the same time to pick the clone source. Also, the cloning logic is better. In PSP, when the source point reaches the newly cloned area, it now picks that up and allows you to clone continuously in one motion. In Photoshop, when the source point reaches the point where the clone was laid down, it instead ignores it, and picks up the original area that you wanted to be covered up. This means I have to stop and start to lay down the clone in multiple patches. This might be default behavior which I haven't figured how to change. Hmmm... I'm still using PhotoImpact 10... from 2004... perhaps it's time for an upgrade? Does it still come with the Protexis phone home Big Brother garbage? PSP has been my editor of choice since its inception. For now, I'm staying with PSP 8, although they recently sent me an offer to upgrade to ver. 9, for just $14.99. Now I see why they made me such an attractive offer!!! I think it's one-click photo correction is FAR superior to anything else. You probably are right. I have always been happy with PSP's capabilities and its user interface as well. Corel's AfterShot also has a similar feature. Editing is very quick with either of these two programs. Hi ! PSP 2018 trial does not start...downloading does not move (Win 10,windows defender off )what might be the problem ?? Thank you ! No problem on my end. Last week I got an invitation to join a webinar to learn all the new stuff which was in PSP 2018 (I just have upgraded to PSP 9) and I was so disappointed! There is very little in new features which can tempt me. Perhaps the speed at which it launches has improved, but to verify that I would need to benchmark the software. Quite honestly I will stay with PSP9 for the time being. The webinar did not convince me. PS: I also use PSE – especially for printing and organising my photos. And - I admit – I quite like their autosharpening tool which works well on standard web-published pictures. PP software is so cheap especially if you wait when they are on sale compared to photography hardware and they have a bigger impact on digital images than upgrading camera bodies. I try to have Paint Shop Pro, DXO, Capture One, OnOne plus many of the free ones, like Nik, Rawtherapee, etc. Corel has better prices than Adobe and their products do everything I need to do. I don't think you can assume that professional photographers use only Macs. Pollyanna told me that pros use macs. Seriously. We've got Coreldraw/Photopaint, Video Studio, etc. trying to push on us! our editor LOVES the CorelVideo Studio software! 4K 4096x2160 60fps video footage! <=== Not an iSheep, never was, never will be. I like PSP. My go-to editor. Although I also have the video studio, I don't use it much because I don't shoot much video. I do have ALL the PSP versions (since the DOS days) in my cabinet, up to PSP 8, which is what I am on now. Rarely I had to pay retail. Corel always sends me very attractive upgrade offers, usually for less than $30. The days of Pros using only Macs was over many years ago. Where have you been. Are you stuck in 1998? No it is not a serious question. I have used various versions of PSP, I still keep a copy of X2 which for me is the most user friendly and speediest, I have X8 it is ok but I like X2 better. I will probably try X9 to see if it is worth it. I much prefer the UI of PSP over Photoshop. Not sure how PS works but PSP offers a 32 and 64 bit version which sounds good except most of the plug-ins I use only run in 32 bit mode anyway. The biggest concern about PSP is plug-in compatibility. PaintShopPro looks like it was a painting program first and foremost, that's merging into an all in one like photoshop. Photoshop, on the other hand, specialized in processing of photos, which slowly gained drawing and design tools slowly. If you're processing photos, I bet Photoshop will still be the best tool. Do they even have the resources to be pushing out raw compatibility updates in a timely manner (near release day of the camera) for every camera that hits the market? I doubt it. Raw conversion is very important to many photographers. What's PSP raw conversion like now? And are there camera updates periodically? Paintshop Pro can open most raw files for editing. But for a specific raw developing program, check out Aftershot. It's included with the Ultimate package of Paintshop Pro. My impression is that Aftershot is vastly inferior to Lightroom/ACR in terms of RAW editing. However if you have Lightroom standalone or some other RAW processor, Paintshop Pro is potentially a viable alternative for people who don't want an Adobe subscription. Lightroom can send TIFFs to Paintshop Pro, and Paintshop Pro is a step up on Elements, as it supports 16 bit layers, and scripting/macros like full Photoshop. Photoshop can still do more than Paintshop Pro, but not everyone may need everything that Photoshop offers, and plugins like Nik, Topaz, On1 etc work with Paintshop Pro. I loved PSP when I used windows but that in a different millennium. Windows has changed a lot in this century and PSP is not subscription based. Love. @Dpreview - any plans to do a comprehensive review of this? Granted many of us can download the trial and compare to Photoshop and C1 pro and Silky Pix etc but your analysis is always welcome. Thematic, that would indeed be very useful. Has anyone used both Corel PaintShop Pro 2018 (either standard or Ultimate) and Serif's Affinity Photo- so we can have a comparison? For what it's worth - I have used Adobe Photoshop many years ago - and yes, found it a great tool. However having recently bought Serif's Affinity Photo (for Windows) - a bit over half a year ago, and I also find that a great tool. Both Adobe Photoshop and Affinity Photo have their quirks and nuances, but I have become comfortable with Affinity Photo... and really find it powerful and now quite intuitive. I am just interested how Corel PaintShop Pro stacks up and compares? If there is ever an issue / reason that I can't use Affinity Photo, then it's good to know what other options are out there. Cheers... I look forward to the responses / comparisons / feedback. I use Affinity, Paintshop Pro X9, and several others. If you've already bought Affinity and are happy with it, you probably don't need PaintShopPro. If someone were purchasing a first program, either one would be fine. PSP seems to have more functionality and is faster, but with the prices being so much higher I'd have a hard time not recommending Affinity instead. For the record though, both are good. Thanks Bobthearch... really appreciate you taking the time to reply here. That's helpful. I'm really quite happy with Affinity Photo... as I wrote before, I have used an older version of Photoshop for a few years (many years ago)... and briefly looked at Adobe's Creative Cloud - but I'm very happy with Affinity Photo. But if there were ever a reason to change (e.g. compatibility issues - though having said that, I don't plan to change cameras in a hurry, I'm very happy with my 80D, 7D and 700D). Or if Serif / Affinity decide to move to a subscription / cloud environment, (so far it seems they won't... at least for quite a while at least, I'm hoping never!)... but in the eventuality it would, I like to know what other options there are out there. So far, I'm glad to hear that a number of other users that I've talked to / chatted with, and other responses else indicate most people say Affinity Photo is really good in terms of functionality and power. I made the huge mistake of buying PSP Pro Ultimate X7 a couple of years ago. It turned out to be over complicated, clumsy and offered no improvement in capability over PSP Pro X2. After an update, I was constantly nagged to upgrade to the next version and ended up uninstalling the package as I just couldn't put up with this nonsense. What also annoyed me was the very poor system of vertical correction and distortion control that was excellent on PSP versions like Pro 8, but was dropped for no obvious reason. Corel just seem to have a moment of madness when they took it out and replaced it with a third rate substitute, for no obvious reason. As I have no expectation of Corel having made the kind of improvements I want for doing serious work on photographs, I don't think I need this new release, even if they want to give it to me for free. Help -> Message Preferences -> uncheck "Keep me informed with the latest producted related messages"
I don't know about how this specific feature was implemented in Pro 8, but saying X8 has "no improvement in capability" over X2 is inaccurate to say the least. @ Venture Star- my experience exactly. It just felt like I was always pushing, dragging, and coaxing a big clumsy box through the forest trying to make it do what I needed. I was sucked in for a couple of upgrades when Corel boasted improvements that just didn't exist in my opinion. I've been happy with Adobe's LR and PS subscription ever since I gave up on PSP 3 years ago. I really wanted to love PSP, but it never materialized. Do you still think there's "no improvement in capability"? Prognathous - I have used Corel and Adobe for many years. At one time, there were significant improvements to everyone's software. Now I see things on recent PSP editions that are simply there for the sake of it. PSP X8 does very little better than X2 and it's simply more cluttered and gimmicky - IMHO. I don't doubt there are certain things on 2018 that will be judged as considerable improvements by Corel and some users, but I can see nothing that is likely to encourage me to start using it and I really don't think Corel are listening to users too often. They are pre-occupied with the appearance of their products rather than good solid features, and often simplicity that provides good results is more useful than having something that looks like the control panel from a space shuttle. I wonder how it could be more affordable than ever since I paid $49.99 for Paintshop Pro Ultimate X8 a couple years ago. That release seems like a more affordable price than this release. I recently switched from LR/PS to Capture 1. Could someone tell me if this program has legit layers like PS or is it a selective adjustment system like LR and C1? This software targets the same domain as PS. If you are looking for an alternative try Affinity Photo. This is a dead slow program, unintuitive and hard to master. It is way behind what Lr and COP have in store. I would not recommend it to anyone. Why not download a trial version and decide yourself? Anyone know if this new version can still use the classic PSP tubes? It certainly has tubes still in it. I've tried copying x6 tubes in to v2018 and they work. The new 2018 version is WAY better than the x6 version I was using. Very fast load times. More importantly little to no lag when using paint brushes - especially things like large diameter saturation brushes on large images. What I meant was actually the old, classic tubes from about 14 years ago. I have a trillion dollars worth of custom made tubes. Corel needs to get rid of those annoying popup ads. Very annoying. I always found Corel very non intuitive and hard to master. Complicated the old interfaces. Except for perspective correction - I have yet to see anything handle that better or easier. And Photoshop is intuitive? Oh, please! I think they spelled their head office city incorrectly at the beginning of the press release. It's Ottawa (Capital of Canada) not Ottowa. Well spotted. Doesn't inspire you with confidence in the rest of the package! Great programme. That's all really. I've been using PSP for nearly 10 years and I've sampled many of its iterations in between. My daughter who is a graphic designer uses PS for her high end fashion designs and for her requirements it is indispensable - I can understand why that is. Not so for my photographic requirements where PSP suits perfectly. I think sometimes it is stubbornness. I've used photoshop almost 20 years. I'm so "in tune" with it, it's second nature. I've tried to ween myself to use something else, but it takes me too much time to figure out where things are, how to do certain things that I don't even think about in photoshop. Plus, the cloud pricing for me is a no brainer. I just use the photography option at ten bucks a month. I've been upgraded to new versions 3 times this year. I used Coreldraw 2.0 and 3.0 and it was ok, lots of bugs, and then there was Coreldraw 4.0 ...., a software disaster beyond belief. Anyone remember? It was ages ago in the ninetees of last century. I said then, never again I use software from Corel. And I stick with that. I've been using it for many years without any problems. I remember those days, lots of communications with their helpline who blamed my computer the issues until a program patch dropped through the door 6 months later. It was always know not to purchase an even numbered release. However, things are very different today. I completely understand. I despised getting Corel files in the prepress department at our print shop. Most of the time they were just awful. I only liked it for their clipart and clipart book that you got with it. My favorite back then was Aldus Freehand and Pagemaker was okay too. Quark was awkward but it had a lot of power once you learned it. But does it have what Adobe calls "Selective Color"? And hasn't Apple promised "Selective Color" for its new Photos, I guess releasing in the fall of 2017? Well, i can honestly say, that i was PSP (Paint Shop Pro) User since Version 1.0, for real...when it was a very small, little Shareware Tool. I've used it with Windows 3.0a back then. :-) For many years, i haven't had an alternative Software, and JASC was way okay - so i sticked with it. I've 1st looked into PS (Photoshop) when it was at Version 3.0, but knowing it much earlier...the coming years, i've looked at PS here & there at friends, coworkers, etc..but found the GUI too complicated. Finally, i've went the PSP Route p to X2 12.50, whileas having used PS on my own since CS4, CS5, and currently since years stick with CS6, because it does all i ever wanted. I have tried many alternatives, but always coming back to PS, because there is no alternative for me. I dislike the PSP GUI since some iterations, and somehow feel too limited by it's GUI and RAW capabilities. To each their own, what suits one best. Looks like it's still stuck on Windows 3.0 judging by the interface. What does Paint Shop Pro make better than Photoshop ? Genuine question, I used it 20 years ago last time ! It's obviously better at not being available for OSX! Run without a rental fee. Extremely affordable and very capable for the price. Everybody thinks Photoshop makes them great photographers, when all they really need is something like Paintshop Pro. You get a feature set close to CS but for the price of Elements. For the price of five months of Adobe Photography subscription, I purchased PaintShop Pro X9 Ultimate outright. And I get to keep using it forever without ever paying another penny. It is not better - but it is within a price range I am willing to pay. If I could afford to buy a very nice house right now for the same price as I will pay to rent the one I'm in for 5 months then I'd be a fool. The only reason I rent right now is that the buy price is the equivalent of 33 years of rent payments and I'd have to be sure this is where I want to live for the rest of my working life. Still it stinks to rent because thinks that you can never pay off kill wealth potential--even little things like CC. Non-subscription - when I'm sick of PS I'll lose it. I have PSP forever. It had face detection before LR - maybe its more mature. IDK. It's one-click photo correction is THE BEST. It is absolutely the best - no question.